Roxanne St. Claire returns to her romantic suspense roots with BAREFOOT WITH A BODYGUARD, the first book in her new Barefoot Bay Undercover trilogy and fans everywhere are cheering. Expertly combining the heartwarming romance of her previous Barefoot Bay books with the heart-pounding suspense of her earlier romantic suspense series, she brings us a page-turner that grabbed me from the first page and still hasn't let go. And, as an added bonus, we finally learn more about the deliciously mysterious, ex-CIA agent, Gabe Rossi! (his full story will be the third book in the trilogy) I highly recommend BAREFOOT WITH A BODYGUARD! Newly divorced Kate Kingston is finished having her life controlled by men. She's ready to stake a claim for independence when her high-profile judge father begins receiving notes threatening Kate. Her father packs her off to Barefoot Bay, an island off the coast of southwest Florida where she'll be protected by Gabe Rossi's new company, designed to sweep people in danger off the radar until either the danger has passed or new identities and locations can be secured for them. Kate isn't happy about her father taking charge of her life - again - but figures she can use the time to relax and study for the Bar exam, something her lawyer ex-husband refused to allow. Kate arrives in Barefoot Bay to discover a few things her father neglected to mention: 1) no contact with the outside world, 2) the threats are much worse than she was led to believe, and 3) she's sharing her bungalow with a hard-bodied, MMA master who she has to pretend is her husband! Alec Petrov has spent much of his life on the run from a Russian mob boss. Alec was only thirteen when his dying father signed him over to the ruthless man in exchange for a promise to leave his business and wife alone after his death. Made to do something that has haunted him since, Alec's hand was then tattooed so that he would always know he belonged to the mob boss and would never forget what he was meant to be: a killer. When his mother died, support came from an unlikely source and Alec joined the Marines to escape his forced destiny but now he's home and it's become increasingly clear that he'll either be forced to accept that destiny...or killed. He's more than willing to be a bodyguard for the judge's daughter until the Feds can bring down the mob boss who's after him. How hard can it be? But then he meets Kate and, suddenly, everything becomes much more complicated. For their own protection, Kate and Alec are not allowed to share any personal information, including their real names, but Kate is relentless and soon Alec finds himself divulging information he never thought he'd share with anyone. The chemistry between them sizzles and as they get to know one another better deeper feelings begin to stir though many obstacles stand between them. They come from different worlds, Kate is determined to never again be under a man's control and Alec...well, Alec just about broke my heart. Here's this deeply honorable, caring man who has been made to believe he's unworthy of happiness, unworthy of a good life, unworthy of love. Will Kate be the woman to teach him otherwise? Or will the bad guys find them before they have the chance to discover what could be? Great review, PJ! This one is in my TBR queue. 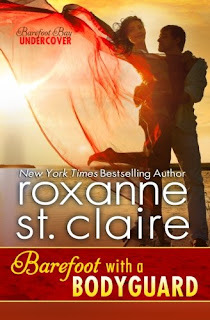 I'm not a big reader of romantic suspense, but I knew from my first Bullet Catchers novel, which I won in a giveaway, that Roxanne St. Claire would be an exception. I love her characters. Roxanne write some of the best romantic suspense available and I have missed her stories. I am so glad that she is back with this new series. I agree, Joan and this book does a great job of blending the romantic beach feel of Barefoot Bay with the edgy danger of Gabe's new business. I've enjoyed her books for quite a while - this one sounds good too! Oh, I can't wait. I love her books especially her bullet catcher series! Romantic suspense is my absolute favorite to read. I love her books will have to look for this one..
You can always depend on Roxanne for a good read with characters worth getting to know. Thank you for the review. I love the barefoot series and am really looking forward to reading this one! They never disappoint!